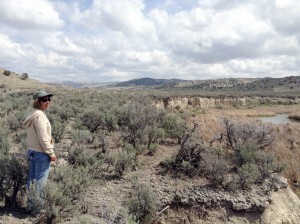 ELKO, NEVADA – Carol Evans parked the Bureau of Land Management pickup truck and stepped out onto dusty earth cracked with the scars of drought. Although it’s April – typically one of the wettest times of year, even in Nevada – a prolonged dry spell stretches into its fourth year, causing more trouble for the hardy people and wildlife that live in the nation’s most arid state. “I’ve never seen anything this bad,” the BLM fisheries biologist and lifelong Nevada resident said, reflecting on the historic drought that has gripped much of the West. 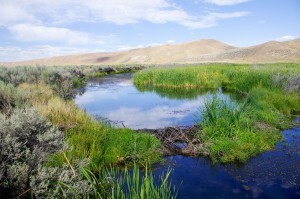 Only yards from the truck however, the desert scene transforms into an unlikely oasis, where the bed of Susie Creek is filled by a sprawling pond, encircled by cattails and other vegetation. Throughout the day, a muskrat and ducks, geese, egrets, mergansers, blackbirds and sandhill cranes patrol the creek bed. Evans brought me to see the one keystone species making all of this possible – Castor canadensis, or the North American beaver. 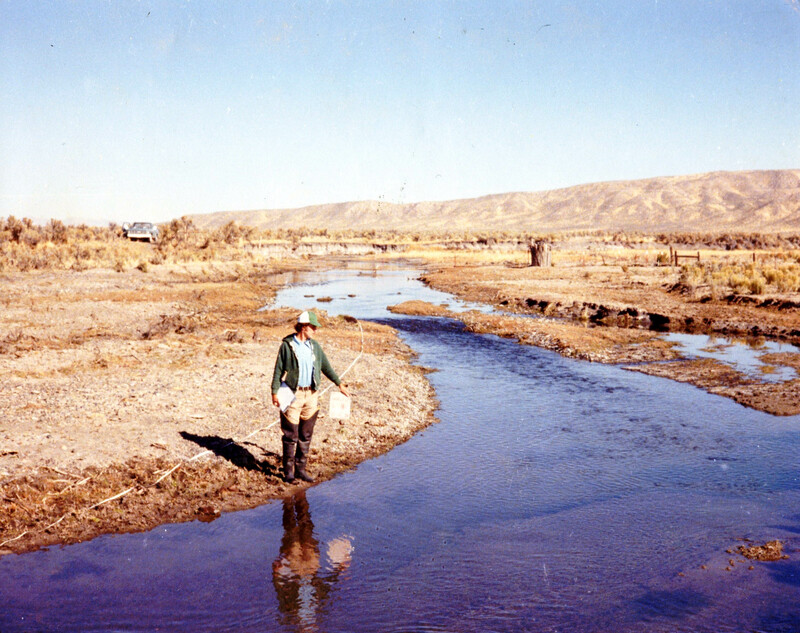 Sure enough, bisecting the creek bed in front of the pond, a distinctive dam of neatly piled sticks bottled up the once-feeble stream and collected the precious lifeblood of water for the surrounding desert community. Underground, the dammed-up pools are modestly replenishing the water table, even during drought years. 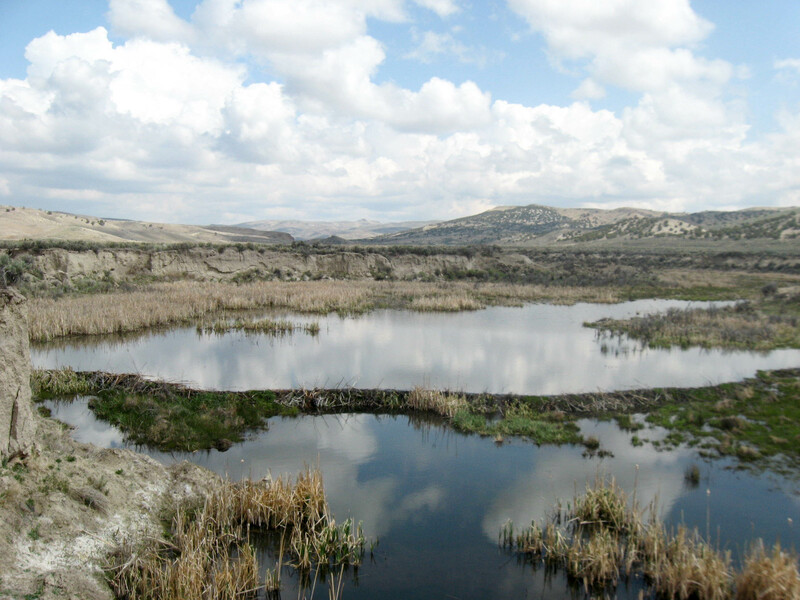 Though not yet verdant with spring and summer greenery, the beaver-made wetland stood in unbelievably stark contrast to the Great Basin backdrop that enveloped us, where little more than parched sagebrush and cattle dot the high desert. 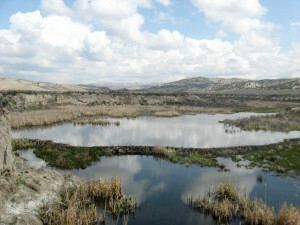 The juxtaposition provided a glimpse of the beavers’ tremendous power as water managers. But Evans emphasized that beaver are only one dimension of Susie Creek’s comeback story, where their success relies on a delicately balanced relationship with neighboring cattle ranches. “It’s a story about livestock grazing,” Evans said. 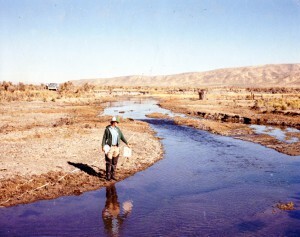 The rebound of Susie Creek and Maggie Creek in the adjacent watershed began in the early 1990s, when Evans approached ranchers leasing BLM land along the waterways with a proposal to improve grazing practices and restore the riparian habitat, primarily for the health of local fisheries. “A lot of it was done for the reintroduction of Lahontan cutthroat trout,” Evans said, referencing Nevada’s state fish, which faces an uphill battle to survive in the face of climate change. Evans said that the area is predicted be out of the species’ temperature range within the next couple decades. Fences were put in to restrict cattle access to riparian corridors, enabling vegetation to reclaim the creek bed, trapping sediment and building a floodplain. By 1996, a number of willow saplings had taken root, and by 2003, beaver recolonized the creeks as an unintended consequence of the restoration effort. “I didn’t know it would turn out the way it did,” said Evans, noting that throughout the BLM’s Elko District there has been a “build it and they will come” relationship between rehabilitated habitat and beaver. 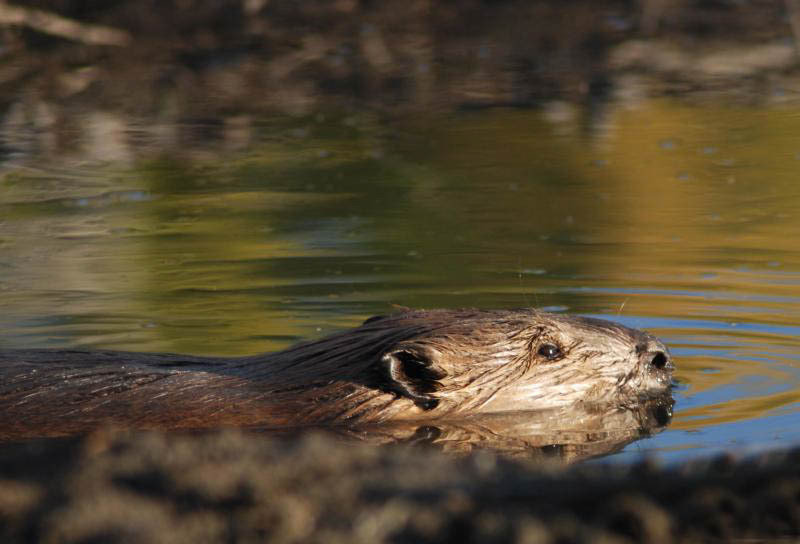 Although Evans does not know precise population data, beaver are now found in a number of regional streams, including an 11-mile stretch of Susie Creek and approximately 16 miles of the Maggie Creek basin. Beaver are hardly newcomers to the area. In colonial times the species used to be nearly ubiquitous throughout North America before their pelts ignited a fashion craze that fueled exploration of the continent and eradicated them from much of their historic habitat range. Besides humans, beaver are perhaps the animal that exerts the greatest influence on the natural environment, and the wide-scale elimination of the species had a profound impact on water resources. From the early 19th century to the late 20th century, an estimated 48-64 million acres of American wetlands were converted to dry land, with much of that habitat loss linked to the simultaneous decline in the beaver population. “Look at those numbers in terms of water that’s being held,” said Dr. Suzanne Fouty, an Oregon-based hydrologist who works with the U.S. Forest Service and has visited Susie and Maggie creeks. Fouty likened that water storage system to savings accounts. But beaver habitat can change that, she said. And those “savings” influence more than just surface water, as they can percolate through soil to become groundwater and recharge aquifers. At Maggie Creek, a one- to two-foot rise in the water table has been observed, even during drought years. 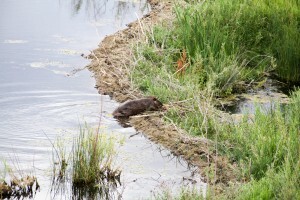 Evans said that beaver habitat has such tremendous water storage potential because the species essentially converts a watershed into “a slow-moving lake” progressing through a staircase of beaver ponds, instead of as a gushing torrent. She believes that’s how the area’s streams once flowed in their original state, since soil profiles still show the traces of long periods of standing water in the valley bottom. But grazing, too, can change the landscape. Dan Gralian is the general manager of the 400,000-acre TS Ranch, bounded to the east by Maggie Creek. He acknowledged that generations of abusive ranching practices hurt the land where trappers left off. That destructive legacy is still evident from the old, dry irrigation ditches sitting 10-15 feet above the present level of Susie Creek, where beaver and cattle are attempting to coexist as unlikely neighbors. Approximately one-eighth of the country’s landmass – totaling nearly 250 million acres – is public land administered by the federal Bureau of Land Management, with Nevada containing the highest percentage of BLM land of any state. Ranchers in the West commonly have leasing arrangements with the agency to graze a pre-determined number of cattle on thousands of acres of public land. When livestock wander unchecked, their grazing can be ecologically damaging, especially in sensitive riparian areas. “It’s all about time and timing: When they’re there and how long they’re there,” said Evans, explaining that during hot summer months, unmanaged cattle prefer to loiter in creek beds, suppressing plant growth and contributing to erosion. Though a fisheries biologist by title, Evans has made range management and riparian ecology a focal part of her work through grazing agreements on BLM land. 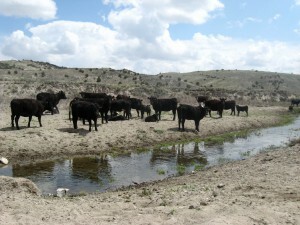 Collaborative ranchers along Susie and Maggie creeks have seen the benefits. Enhanced water availability was echoed as a key benefit by Mitch Heguy of nearby Heguy Ranch, who noted that some other ranchers need to bring in water by the truckload to get their cattle through the year. With proper management, growth of forage is also aided along beaver-irrigated habitat. That forage was also paying dividends for Heguy. “It can save your bacon on dry years because you’ve got green grass,” he said. The combination of food- and water-security has meant that Heguy has not had to make significant reductions to his herd – and, subsequently, his bottom line. “We recognize that healthy wildlife habitat is healthy cow habitat,” said Griggs, who believes most ranchers welcome the beaver. But he adds that not all ranchers are receptive to the animals or willing to change their traditional practices to enter into a grazing agreement. Although Griggs, Heguy and Gralian are enjoying successful partnerships with Evans and the BLM, factors such as mistrust of government, bureaucratic dysfunction and high agency turnover can further complicate grazing agreements on public land. “When you do business with a government agency, it’s like going to the post office or DMV – it’s burdensome,” said Griggs. Living with beaver can have a few minor drawbacks. The animals can sometimes dam irrigation ditches or road culverts and disrupt cattle drives. 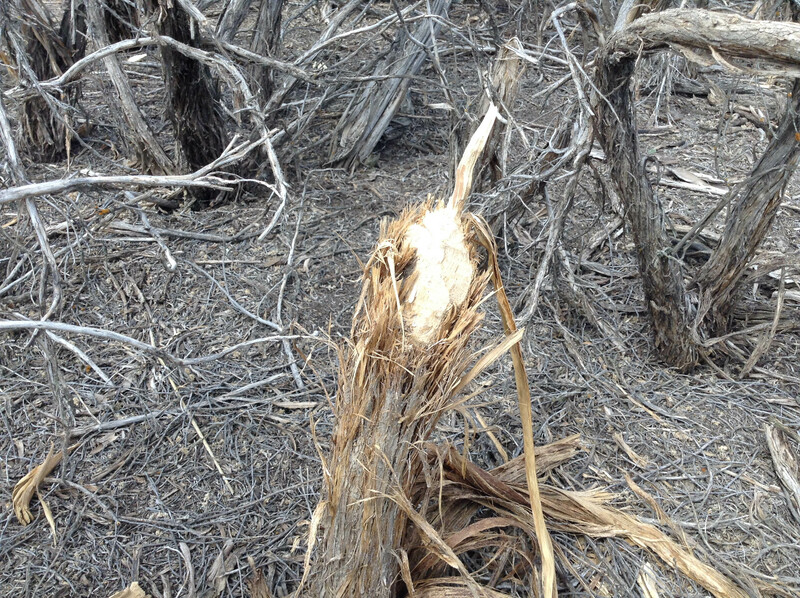 But beaver are not impervious to drought, and even at Susie and Maggie creeks, the species faces an uncertain future. 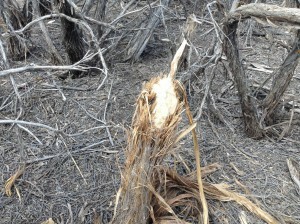 “The drought is really testing the beaver population,” said Evans. The beaver may also fall victim to their own success, reinforcing that they, too, can be a stressor, especially in early-recovery systems like Susie Creek. There, beaver are jeopardizing willows – their primary food and building material – through a combination of consumption and drowning them out. “I think they’ve reached their capacity at this stage of vegetative recovery,” said Evans, noting that if another five to 10 years of regrowth had happened before beaver returned, the area would be better suited to support them long-term. More than a century removed from their widespread extermination, beaver populations can still be sensitive to trapping. Legality varies by state and, although permitted in Nevada, Evans said trapping has not slowed their comeback near Elko, which she attributes to the current low value of pelts. Whether beaver can be used on a broader scale to help the West conserve dwindling water resources remains to be seen, but the recolonization of streams in northern Nevada provides a hopeful snapshot of their climate change mitigation potential. “Nevada is so water-limited, if beavers can transform this landscape, they can do it anywhere,” said Fouty. Similar projects have taken root in other parts of the West. In Washington state, Forest Service officials are using reintroduced beaver to increase water resources for coho and Chinook salmon. In Colorado, “nuisance” beaver are being relocated from population centers to habitat where their ecological services will be less disruptive. And in Idaho in the 1940s, the state Department of Fish and Game launched a stranger-than-fiction campaign to parachute beavers in crates into the backcountry. Whatever role beaver ultimately play in the future of the West, they will need their significant environmental footprint to find a balance with ranching and other land uses. But if the BLM’s Elko District is any indication, that’s certainly possible.